$55,000 PRICE REDUCTION; OWNERS ARE MOTIVATED! PET FRIENDLY (2 DOGS)-OFFERS BEST VIEW IN COMPLEX; HOA PAINTING EXTERIOR-FROM RESERVES! 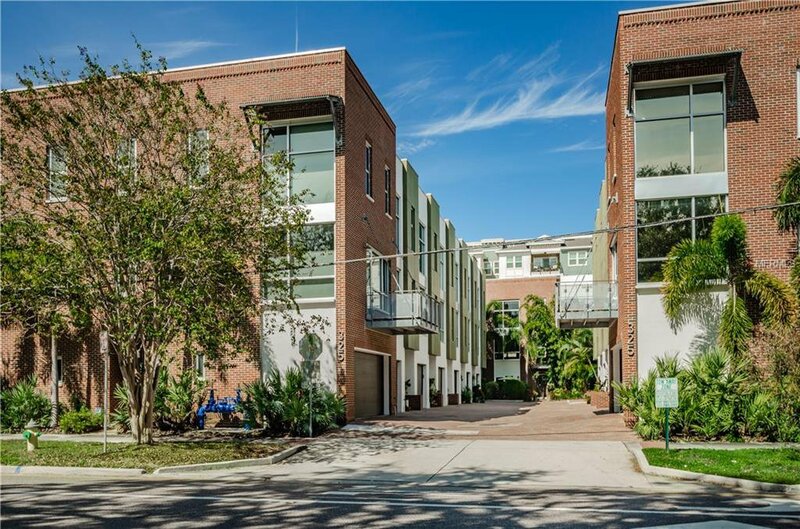 AN OPPORTUNITY TO LIVE IN THIS LUXURY TOWNHOME IN HEART OF DOWNTOWN ST PETE IN STYLE! TAX RECORDS-INCORRECT! IT IS ONE OF TWO LARGEST IN COMPLEX, THE TRUE S.F. IS 1,998 NOT INCLUDING THE 2 CAR GARAGE. THIS 3 STORY, 3 BDRM, 3.5 BATH, 2 CAR GARAGE, 2006 PROPERTY HAS BEEN BEAUTIFULLY REMODELED. YOU WILL LOVE THE OPEN PLAN WITH ALL ITS NATURAL LIGHT THROUGHT EACH ROOM & MANY LARGE WINDOWS. THE KITCHEN HAS STAINLESS APPLIANCES, GRANITE, SOLID OAK KITCHEN CABINETS( 2017), TILED BACK SPLASH, RECESSED & UNDER CABINET LIGHTING, SUN RETARDANT FILM (3M) ON ALL WINDOWS, HEAT BLOCKING BLINDS & DRAPES IN ALL ROOMS & WALK-IN CLOSETS. THE SPACIOUS MASTER BEDROOM HAS BEAUTIFUL GREEN SPACE VIEWS FROM IT'S LARGE WINDOWS OF USF'S SOCCER/TENNIS FIELDS AND FEELS LIKE A PRIVATE RELAXING RETREAT QUIETLY TUCKED AWAY. THE MASTER BATH HAS A NEWER CUSTOM WALLED SHOWER, ALL BUILDER TILE WAS REPLACED WITH NEW CUSTOM TILE, SOLID HARDWOOD BANISTERS 2013, & 5 NEW CEILING FANS IN ALL ROOMS, (2016). THIS HOME IS FRESH & CLEAN THROUGHOUT. TWO BEDROOMS ARE BEING USED AS OFFICES WITH ADJACENT BATHS. THE OWNERS WILL LEAVE, WASHER, DRYER, LIVING ROOM TV WITH WALL MOUNT. PLEASE NOTE THE PRIVATE OUTDOOR PATIO. THIS IS A PET FRIENDLY BUILDING REQUIRING NO FLOOD INSURANCE IN WALKING DISTANCE TO THE WATERFRONT, YACHT CLUB, BEACH DRIVE WITH THE AREA'S BEST RESTAURANTS, SHOPPING, NIGHTLIFE, MUSEUMS & MORE!